Salvia purpurea is a tall evergreen which flowers in winter with jacaranda coloured flowers, though the exact shade can vary if seed grown. It is a brittle plant so needs protection from a lot of wind. 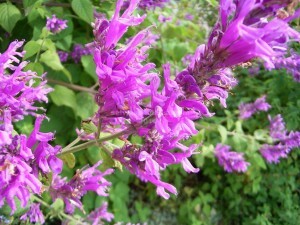 It is similar to iodantha in growth and flower but a different flower colour. The foliage also tends to have a grey tinge. In the mountains near Puerto Vallarta in Mexico iodantha is a very common plant and I asked an expert if it could be confused with purpurea with a colour variation and he said no because it grows at a different altitude! Thankfully in cultivation we mostly don’t have to worry about what altitude salvias are suited for as they are mostly so adaptable. I find purpurea quite difficult to grow from cuttings in summer (they rot), so get them going in winter.